Temperature is one of the most commonly measured values. Due to the vast majority of needs and applications connected with temperature measurement, there is a large number of sensors, transducers, and measuring devices on the market. That is why we have so many problems with making a choice of an appropriate sensor and measuring device. complexity of a transducer and measuring system. Most modern devices intended for temperature measurements can be classified as: contact expansion thermometers, electric transducers and contactless optical transducers. 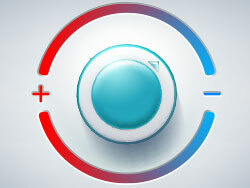 In case of contact measurement methods, there is an exchange of heat between a measuring object and a thermometer. They are considered to be invasive methods, whereas optical methods are non-invasive. manometer thermometers sense changes in the liquid, gas/water vapour pressure caused by thermal expansion. Measuring ranges of technical and laboratory thermometers range from -50°C to +200°C. The measuring resolution is at least 0.1°C. Special thermometers allow us to make measurements within the range of -100°C-400°C. Thermometers of this type are less commonly used, however, they are characterized by good stability, they do not require power supply, and they are resistant to unfavourable environmental conditions. Due to the fact that these thermometers have been used for a long period of time, they are still considered to be valuable reference and laboratory thermometers. resistance thermometers and semiconductor thermometers (passive; electrical methods of temperature measurement require power supply). In most contemporary electrical thermometers resistance sensors (RTD) or thermocouples (TC) are used. Both groups of sensors have been standardized in European standards. EN 60584 standard defines characteristics and metrologic parameters of thermoelectric thermometers, whereas EN 60751 standard defines physical characteristics, metrologic parameters and parametric constants of platinum resistance sensors. Thermistor sensors are not specified in norms, however they form an important group due to their attractive price and very high sensitivity in a commercial temperature range. They make use of a change of resistance caused by temperature changes. Platinum (Pt) is the most frequently used thermoresistant material, however, we can also buy nickel (Ni) or copper (Cu) thermoresistors. Standard sensors include Pt100, Pt500 and Pt1000 devices. It means that their nominal resistance in 0ºC is 100Ω, 500Ω or 1000Ω, respectively. RTD sensors are considered to be the most accurate. Their accuracy of the measurement is specified in the standard, and it is described as class A and class B. In practice, there are also additional accuracy classes, such as: AA, C, ⅓B or 1/10B (Tab. 1). Tab. 1. Accuracy classes (parametric tolerance) of RTD sensors. Temperature measurement with the use of RTD sensors is done using one of 4 available measurement systems (Fig. 1). In case of class A sensors, it is recommended to use system with full or partial compensation. Measuring current flowing through RTD sensor should not exceed 1mA due to self-heating of sensors. Stable, monolithic current sources with the current of 100µA ÷ 400µA, with standardized sensitivity coefficient of Platinum αPt=0.00385Ω/ºC, provide a sufficient level of voltage drop on Pt100. That is why in the measuring system it is possible to use typical analogue-to-digital converters with the resolution within the range of 16-24 bits. They are a kind of thermoresistors made of sintered materials characterized by high temperature coefficient. They can be divided into two groups: NTC sensors, with negative temperature coefficient, where temperature increase causes reduction of sensor resistance, and PTC sensors, with positive temperature coefficient. Thermistors are characterized by high sensitivity within the range of 50°C ÷ 125°C. However, within extended temperature range, they have strong, non-linear thermometric characteristics what makes converting resistance to temperature difficult, and reduces the accuracy of measurement. Power and measuring systems are identical to those used in case of Platinum RTD sensors. They make use of Seebeck effect: heat is converted directly into electricity at the junction of different kind of wires made of two different kind of alloys. Value of this thermoelectric power depends on the difference in temperature of both connectors and their type. Hot connector is a measuring connector, whereas end of the wires serve as a reference point (Fig. 2). Value of thermoelectric power depends on the difference in temperature and value of Seebeck effect coefficients of metals forming a measuring junction of thermoelement. In order for the measurement to be accurate, cold junction compensation (CJC) is used, and additional temperature measurement (T2) is made. The measurement is made at the junction. Thermoresistor, thermistor or another thermocouple are used for this purpose. If we choose appropriate connector materials with care, it is possible to achieve high level of sensitivity expressed in mV/°C. 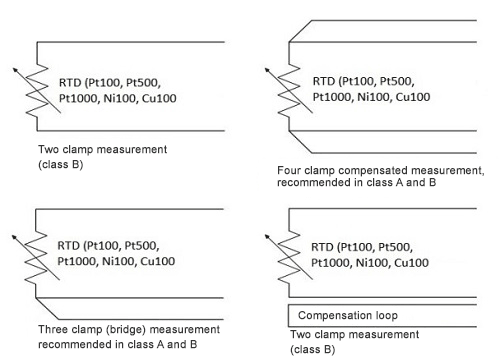 In table 2 you will find the most frequently used configurations of metals forming measuring junctions of thermocouples, as well as electrical parameters of connectors standardized in EN 60584 standard. The accuracy of measurement of thermocouples is connected with their class (1 or 2) and measuring range. The accuracy of class 1 sensors is ±1.5°C. 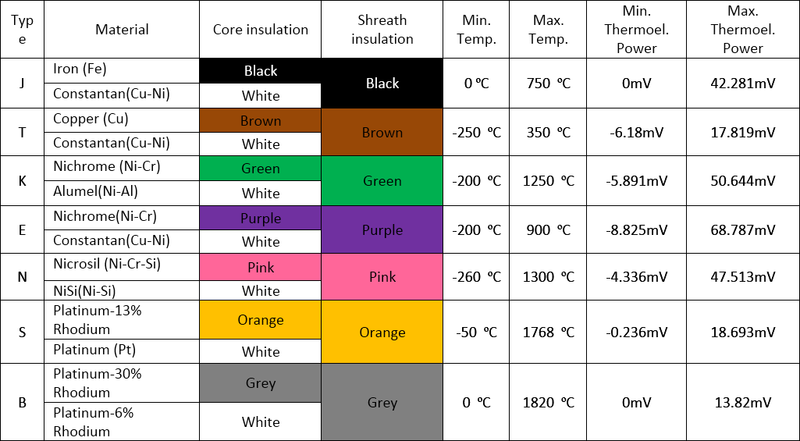 Within the range of -40°C to +125°C, T-type thermocouple (Cu-CuNi) has the highest level of accuracy: ±0.5°C. Among temperature sensors we can also find those that use optical phenomena. The most common thermometers make use of fibre optics and pyrometric transducers. They make use of (installed at the end of fibre-optic cable) GaAs semiconductor sensors, thermochromic sensors, photoluminescent sensors and other sensors for the purpose of making a measurement. Then, they transmit the signal from temperature sensor via fiber-optic cable to optoelectronic transducer. In case of fibre-optic sensors that have direct action, the fibre-optic cable itself is a sensory element. By making use of diffusion of light, the change in refractive index or coupling change of two fibre-optic cables, it is possible to determine average temperature of the fire-optic cable, or even distribution of temperature over the chosen part of fibre-optic cable. Due to their specific characteristics, fibre-optic sensors are mainly used as highly specialised thermometers. They are chemically and mechanically resistant, non-sensitive to electric and magnetic fields and to electromagnetic interference. Their potential measuring range ranges from -200°C to 2000°C, they are characterized by good dynamic characteristics, and they can transmit signal over long distances. These are contactless temperature sensors. This is their characteristic feature; the measurement is non-invasive. In order to make a measurement, a pyrometric sensor does not have to exchange heat with an object being measured. This way, pyrometers do not interfere with the temperature field during the measurement, and their dynamic characteristics are incomparably better. Pyrometric sensors convert thermal radiation emitted by all objects. The intensity of thermal radiation depends on temperature; it is within the visible and infrared wavelength range. In pyrometric sensors, optical systems are used. These systems include lenses, fibre-optic cables and mirrors which prepare optical signal directed to thermal sensors or photodetectors. Thermal radiation (visible, infrared light) can be measured at certain distance from an object being measured bacause it is not heavily distorted. With the use of pyrometers it is possible to make remote temperature measurements in specific points Unfortunately, the intensity of thermal radiation does not depend only on temperature. Type of material and physical characteristics of the surface (smoothness, roughness, oxide coverage, reflectance of the surface, etc.) have influence on thermal radiation emissivity. Ability of thermal radiation is described with the use of emission factor. This parameter was described in the following document: Współczynnik emisyjności - wpływ na dokładność pomiaru temperatury. Pyrometric thermometers can be used to make measurements within the temperature range from 50°C to 3000°C. Photoelectric and dual band pyrometers are characterized by the highest level of the accuracy of measurement: 0.5%. Measurement time lasts up to 1 second, and in case of photoelectric pyrometers, measurement time is from 5 to 100 milliseconds. The main disadvantage of simple, hand-held pyrometric thermometers is the fact that it is necessary to set emissivity during measurement, and to direct pyrometer precisely towards the surface being measured. Thermal imaging cameras work in the same way as contactless pyrometric sensors, however, they measure the distribution of temperature over the surface with appropriate resolution. Due to wide offer of temperature sensors and transducers, we often have problems with choosing a device that would suit our needs. In the table provided below, you will find basic and most frequently used sensing techniques. Tab. 3. Comparison of characteristics of basic temperature sensors and transducers. As far as temperature sensors operating in the industrial temperature range of -25°C ÷ 125°C, we can see that sensors themselves, measuring transducers as well as temperature measuring systems are available in similar prices. Middle class electrical thermometers and loggers which make use of thermocouples and RTD thermoresistors have comparable prices. Within the same price range, pyrometric thermometers and simple thermal imaging cameras can be bought. 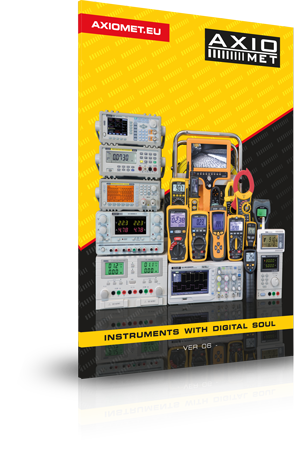 All above-mentioned measuring devices are offered by AXIOMET. The higher the accuracy of measurement, dynamic range, measuring range or resolution, the higher the price of the device. In such a case, basic information presented in this document will help you choose appropriate sensor.